Magnetic resonance imaging has emerged as a noninvasive modality for multiparametric assessment of aortic anatomy, dynamics, and flow. Preventive aortic surgery remains based on maximal aortic diameters, but this strategy has shown its limits to accurately predict acute aortic events. 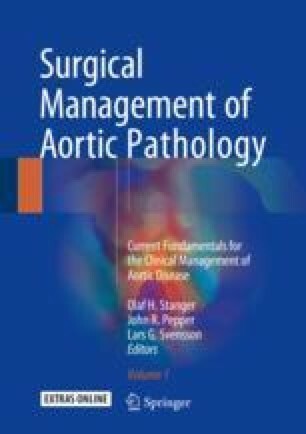 Novel imaging biomarkers such as aortic volumetry, aortic stiffness (distensibility and pulse wave velocity), and flow with new 4D techniques providing wall shear stress or relative pressure maps are promising to enhance our understanding of aortic pathophysiology in vivo and ability to predict adverse aortic outcome. We wish to thank Thomas Dietenbeck and Benjamin Dubourg, MD, for their kind help in generating volumetric and 4D flow images to illustrate this chapter. We wish to thank Nadjia Kachenoura, PhD, and Philippe Cluzel, MD, PhD, for their constant support.